And having all these witnesses we obtain a hope, and our faith becometh unshaken (Jacob 4:6). Melissa, a four-year-old member of a Star A class, knows that important things happen at Church, because when her baby sister was blessed, she felt a special warmth and happiness and her parents told her that that feeling was the Spirit. Emily, Katie, Richard, Melissa, Brad, Russell, Derek, and Peter have all had their testimonies strengthened through the testimonies of others. Perhaps you can think of people whose testimonies have strengthened yours. 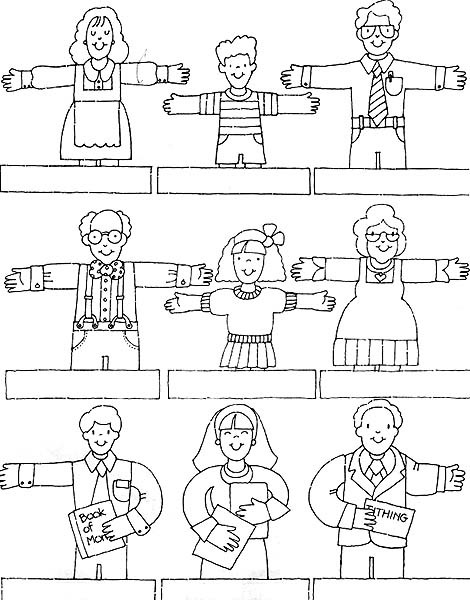 Color the finger puppets to resemble some of the people who have helped your testimony grow. Write their names below the drawing. Cut the puppets out, and tape the ends of each name strip together to form a circle. Place puppets on your fingers and tell who each one represents and how that person strengthened your testimony. Have children role-play situations showing how testimonies can be strengthened by others. For example, a child listens as a “mother” reads a story about Jesus, a child listens as a “church leader” gives a talk, and several children in a family home evening situation present a lesson, music, and an activity about testimonies. Have children role-play being missionaries. They could pretend to knock at a door and give a gospel message or a discussion. Invite a missionary or a returned missionary to talk to the children about sharing testimonies with others. Have the children write letters or draw pictures about what they have learned about testimonies during the year. Mail them to missionaries from your branch or ward.